Jobs Description: Employees Social Security Institution KPK Jobs 2019 can be viewed in our site. The Government of Khyber Pakhtunkhwa recently announced an advertisement for Jobs of Male Medical Officer, Women Medical Officer, and Computer Operator in the Employees Social Security Institution. 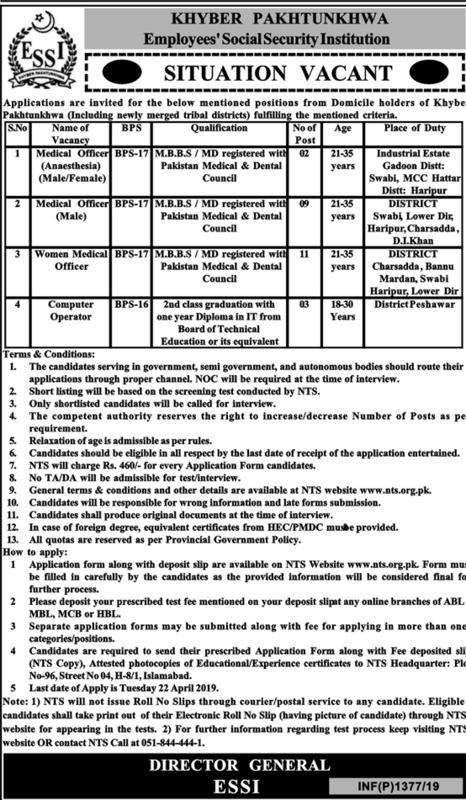 Employees Social Security Institution KPK has required the applications for the following jobs. How To Apply: Application form can be download from NTS (National Testing Services) of Pakistan website. The interested candidates may send their applications to the NTS Headquarters, Islamabad.